Building upon the massive success of previous 5.8GHz systems, Furious FPV steps into the realm of 2.4GHz, offering a multi power VTx with a selectable race ready 25mW to massive 800mW output power for extreme range FPV flight that only 2.4GHz can provide. Featuring a wide voltage input of 7.4V - 25.2V, built-in BEC [email protected] with LC filter with an RBG LED board to provide channel & power output feedback, the Furious 2.4GHz VTx is a multi-channel power house that offers maximum flexibility when it comes to your FPV application. Incorporating the ability to select between 25mW, 200mW, 500mW and 800mW of output power, Furious FPV puts you in control of your range, allowing the perfect amount of output power to be selected based upon your FPV needs. 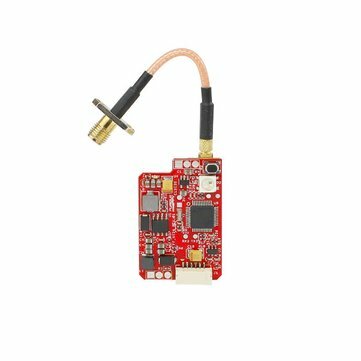 Integrated with a 2A / 5V BEC, the Furious FPV 2.4GHz incorporates a built in LC filter, which aids in video clarity for the optimum video signal while in flight and on the move.